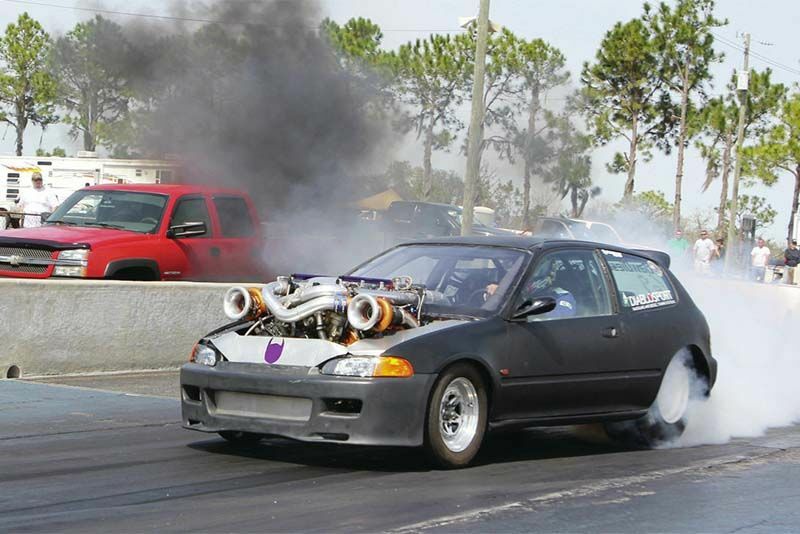 Home / Automotive / Cars / 6.0L Twin Turbo In A Honda Civic? Check This Out! Check out this twin turbo 6. 0L stuffed into an old school Honda Civic. We have to preface this one by saying the video might be a little bit old but, when you see its contents, I think you’ll agree that it’s more than worth the watch! Normally, when somebody beefs up their Honda Civic, they stick with the brand under the hood and slap another Honda engine in the engine bay – but this time, some custom modifications were done to give this Civic a heart transplant like no other. Let’s just say that it doesn’t retain its original four-cylinder engine and doesn’t even step it up to a six. Instead, this thing goes complete overkill that might just have you wondering exactly how they carried out such an engine swap in the first place. When we catch up with this Honda, we find out that whoever was behind this thing managed to slap a 6-litre Powerstroke engine into the car, giving it that good old diesel torque. Combined with the weightlessness that the platform offers to begin with, it must be quite something. Unfortunately we can't find any video of this thing at full tilt but, in this video, we only get to see the car idling around the shop, but would venture to think that with all that power, this thing probably rolls out! A truck fitted with a diesel engine is usually a lot of fun to drive so we would imagine that something this light would bump the fun factor up even more! Following along in the video below takes you on the scene to see exactly what a car like this looks like with the heart of a diesel and the body of a commuter car. If this isn’t the wildest Honda Civic swap and I’m not sure what it is. If you’ve ever seen a similar car with an even more impressive engine, be sure to tell us about it and all about what you think of this diesel-powered monster!